Traditionally here in the States, Thanksgiving is the forgotten holiday that sits between Halloween and Christmas. This is the time of year that those of us in the States are supposed to think about what we are thankful for. According to the people in Washington, this year we’re also supposed to talk to all of the members of our family about politics. They’ve even made talking points available, just in case you have a relative who isn’t crazy about your personal ideology. To me, though, that seems kind of foolish. Why would you ruin a perfectly good Thanksgiving with politics when you could spend your time thinking, talking, and arguing about movies and television? After all, Presidents are only around for, at the most, eight years. Movies are forever. With that in mind, here are twelve random things that I am thankful for in 2013. 1) I’m thankful that there are still visionaries like Shane Carruth who can make films like Upstream Color. 2) I’m thankful for actors, like Robert Downey, Jr., who are capable of making mainstream films, like Iron Man 3, memorable. 3) I’m thankful that a show like Breaking Bad got a chance to remind us of just how good television can be. 4) I’m thankful for Blue Is The Warmest Color. 5) I’m thankful that at least some people understand that The Counselor is one of the best films of 2013. 6) I’m thankful that this October was this site’s most succesful horror month yet! 7) I’m thankful that, in 2013, we can still watch movies like The Passion of Joan of Arc. 8) I’m thankful that I actually saw Tyler Perry’s Temptation because, otherwise, I would not believe that such an inept and deeply offensive film could have been made. 9) I am thankful for Icona Pop’s I Love It, which is currently my favorite song to play while I’m dancing around the house in my underwear. 10) I am thankful that the series finale of The Office was everything that it should have been. 11) I am thankful that Dexter finally ended because, seriously, the show was getting so bad that it was running the risk of overshadowing how good the first few seasons actually were. 12) Finally, and most importantly, I am thankful for our readers and for our subscribers. Y’all are the ones who make all of this worthwhile. Thank you! Someday, I want to have my own tv network. I’ll call it Lisa Marie Television (or LMTV for short) and it’ll be like Lifetime but with the Lisa Marie difference. What’s the Lisa Marie difference? Sweetheart, if you have to ask, you’ll never know. El. Oh. El. For me, one of the highlights of 2012 has been meeting and getting to know the Snarkalecs on twitter. Who are the Snarkalecs? We’re just a group of very witty people who are capable of appreciating films like Two-Headed Shark Attack and Arachnoquake. Every Saturday night, we watch and live tweet whatever’s playing on the SyFy network. It’s the perfect way to end the week. My favorite SyFy film of 2012? Jersey Shore Shark Attack. A great crime has occurred at Greendale Community College. A yam has been callously destroyed and the study group is going to find out who was responsible and make sure the perpetrator is punished to the full extent of the law. This spot-on perfect parody of Law and Order was one of the highlights of Community’s third season. Donald Glover and Danny Pudi were simply adorable playing good cop/bad cop. The latest season of True Blood may have been uneven but whenever Alexander Skarsgard or Joe Manganiello showed up on-screen, the show was perfect (especially if they happened to be naked at the time). As always. This year highlights have included the classic anti-bullying episode and the annual Halloween episode. The previous season of Survivor was one of the best, featuring truly interesting competitors like Jonathan Penner, Lisa Whelchel, Abi-Marie, and Malcolm. Perhaps best of all, the season ended with the most deserving survivor winning the million bucks. A lot of very snide comments have been made about Eastwood’s speech at the Republican National Convention but, personally, I think it was brilliant political theater. Even better, his two main points — that the President is essentially an empty suit and the Vice President is a jackass — are looking more and more true with each passing day. Speaking of great political theater…. The 2012 Presidential election was dominated by debates but there’s only one that was truly memorable and it was the Vice Presidential debate between Joe Biden and Paul Ryan. While Paul Ryan talked about disaster in his overly serious grad student way, Joe Biden grinned like an aging serial killer deep in the throes of senility. This was less a political debate and more a case of performance art. I loved watching the London Olympics this year and not just because of the Fab Five, either. The Danny Boyle-directed opening ceremonies were amazing to watch and I had fun going on twitter to ridicule NBC’s hilariously bad coverage of the games. Oh, c’mon — it was fun! After one of the worst seasons in the history of primetime television, The Office has redeemed itself slightly with its current (and final) season. Even Catherine Tate has become tolerable. Tomorrow, I’ll continue my look back at the past year with a list of my 10 favorite novels of 2012. This has been a truly depressing television season for me and it all comes down to one show. For seven season, I loved the Office. Even when it wasn’t at it best, it was still the show that I based my Thursday nights around. And yet, as I watched the finale of eighth season of The Office last night, I breathed a sigh of relief once it was finally over. Why? Because season 8 was not only the worst season of the Office so far but it was also one of the worst seasons of television that I’ve ever sat through. Don’t get me wrong. I knew that this season of The Office (the first without Steve Carell’s iconic Michael Scott) would be a rough one. However, nothing could have prepared me for just how bad season 8 would become. Looking back over season 8, it’s a struggle to remember one memorable line or moment that made me laugh out loud. Instead, most of my memories center around being annoyed that the show that I loved could have possibly become so …. bad. 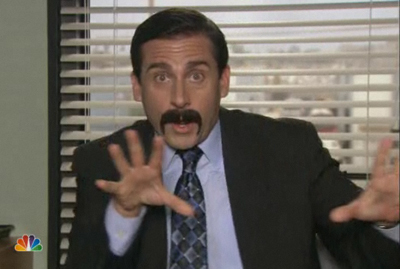 In the future, I’m going to write a post detailing how I would have handled the first post-Carell season of The Office. 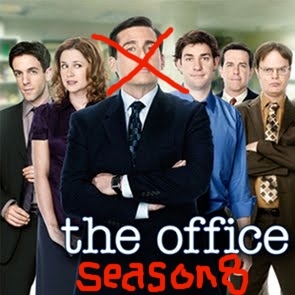 But before I write that post up, I want to take a few moments to highlight 10 reasons why I hated season 8 of the Office. I have to admit that my heart sank a little bit when, during the Season 8 premiere, it was revealed that the show would now center around the character of Andy Bernard. Even before Steve Carell left the show, I always dreaded any episode that revolved around Andy. Andy, who started out as such a perfectly annoying villain in season 3, had developed into a rather pathetic and needy character and Andy-centric episodes were usually the weakest of their respective seasons. It didn’t help that Ed Helms — who is a great character actor — has a tendency to go overboard whenever cast in a lead role. So, I knew from the start of the season that I wouldn’t be totally happy with Andy Bernard as manager but I had no way of guessing just how much I would eventually come to despise the character. Whether he was weakly pursuing Erin or cruelly dumping his previous girlfriend twice in one day or failing to sue Robert California for giving his job away to Nellie, Andy proved himself to be just as stupid as Michael Scott but also a hundred times more pathetic. It was impossible to root for Andy because so many of his problems were of his own creation. As needy as Andy was as a character, Ed Helms was just as needy as a performer and every time he showed up on-screen, I felt like he was begging me to love him as opposed to giving me a reason to do so. It didn’t help that the show’s writers devoted three or four episodes to having everyone in the Office basically spend half an hour tellings us that Andy was a great manager and we really should love him. At the end of last night’s finale, Andy — after being unemployed for the last few episodes — got his job back in the least plausible way imaginable. Instead of firing Nellie, he gave her a new job and then he flashed that big, toothy grin of his. Fortunately, for the first time during season 8, he resisted the temptation to break out into song. Nellie showed up during the second half of the season and essentially appointed herself as the new manager of the office. It was a plot development that made no sense and it was hard not to feel like the show’s producers were trying to force the audience to love Tate as much as they did. Yes, the writers of The Office love Catherine Tate and maybe the audience would love her to if Nellie, the character she was playing, had any real reason for existing beyond the fact that the writers wanted to work with Catherine Tate. Since Tate had no real reason to be on the show, it was hard not to resent the amount of screentime that was devoted to her. It’s also hard to look forward to the fact that it appears that she’ll be an even more prominent character during season 9. At the start of Season 8, we were informed that Robert California (played by James Spader) had somehow managed to talk his way into being named CEO of Sabre. We were told that he was a mysterious, charismatic figure who might be a genius. Instead, he turned out to be just another inconsistent character whose personality changed from episode to episode until finally, he was revealed to be so pathetic that he couldn’t even handle Nellie declaring herself to be the new regional manager. In his first few appearances, James Spader brought his trademark quirkiness to the role but then, once it became apparent that show’s writers couldn’t be bothered to figure out who Robert California actually was, Spader pretty much gave up on giving a performance. Instead, he just became a name actor getting paid a lot of money to do not much of anything. And yet the writers still insisted on trying to convince us that Robert California was an interesting character. The first half of the season was largely devoted to the character. We went to his mansion, we met his soon-to-be ex-wife, and we continually found ourselves wondering why the CEO of a Florida-based corporation was spending all of his time in Scranton, Pennsylvania. Robert California (and James Spader) will not be back for Season 9. In the final episode, Robert California announced that his latest business venture would involve young women from Eastern Europe. It was an unfunny end to an unfunny character. 4) Kevin and Erin: Just How Dumb Are They? This has been an issue for a while but it really became obvious (and annoying) as things got more and more cartoonish during Season 8. Erin and Kevin both seem to be stupid when the plot calls for it and just dumb when the plot doesn’t. It wouldn’t be so much of a problem if not for the fact that there’s no logic to their occasional stupidity. It’s never been firmly established just how stupid either one of them is and, as a result, their inability to understand the simplest of things feels more like lazy writing than anything else. With Erin, this is an issue because this season was largely built around Andy pursuing her. For a plot like that to be effective, you have to care about the characters and to care about the characters, you have to see some sort of vague reality in them even when they’re threatening to go over the top. As for Kevin — well, where to begin? Remember how, in the earlier seasons, Kevin seemed like he actually had the most active life out of the office of any of the people working there? He would show up with a jaunty little hat on his head and he would drop hints about being addicted to gambling. He was even the drummer in not one but two cover bands! Now, he’s just another moron in the corner. Yes, we get it. The senator’s gay. It was funny the first four times that various characters went, “The senator’s gay!” but now, it just feels like a lazy punchline. Wouldn’t it have been fun to see Angela and the Senator’s wedding? Seriously, this is a show that had a tradition of funny wedding episodes but, when given the perfect opputunity, the show’s writers ignored a chance to showcase one of the strongest members of the original supporting cast. Instead, Angela (and so many others) were just pushed off to the side so that we could spend more time with Robert California. 6) What Does Jim Have To Smirk About? Seriously, the man’s stuck in a rut. 7) When Did Pam Give Up On Being An Artist? Whenever I watch reruns of The Office, I’m surprised by how much I relate to Pam. That’s mostly because the Pam of the first few seasons seems to have very little in common with the Pam of the 7th and 8th seasons. Do you remember when Pam was an artist and, even more importantly, do you remember how great it was to watch as she finally started standing up for herself and following her dream during the first four seasons? As I watched this last season, I thought about that wonderfully sweet scene from seasons past when Jim showed Pam the “artist’s studio” that he had set up in the garage. And I wondered if that art studio was still sitting in the garage, untouched since Pam has apparently decided to give up on her dreams and just spend all of her time obsessing on the people that she works with. 8) What do Ryan and Gabe do all day? Seriously, what was the point of Val’s character this season? If you’ve watched the entire season, do you know anything about Val beyond the fact that Darryl developed a crush on her? I didn’t even catch that her name was Val until around her fifth appearance. Obviously, the show’s writers expected us to take some sort of emotional stake in Darryl’s attempts to woo her but they never bothered to figure out just who exactly Val was meant to be. The same can be said, of course, of just about every new character on The Office this season. Can you remember the name of the woman who Andy dumped so he could (finally) be with Erin? How about Cathy, the girl who, out of nowhere, tried to seduce Jim and then mysteriously vanished from the show? Admittedly, this problem didn’t start with season 8. Starting back in season 5, the Office developed a bad habit of carefully introducing and then randomly abandoning characters and plotlines. (Remember Danny, the superhot traveling salesman played by Timothy Olyphant?) However, it’s never bothered me in the past quite as much as it did during season 8. Past seasons at least had someone there to anchor the show even when the writers seemed to get distracted. That, I think, pretty much says it all. So, this year, I’ve been kind of depressed because my former favorite show of all time — The Office — has been just awful! Seriously, don’t even get me started on why it doesn’t make any sense whatsoever that Jim Halpert would have recommended that Andy Bernard be put in charge of the office. Don’t get me started on how the show is now wasting some of the brightest comic talents available. And certainly, don’t ask me what I think about this newest subplot where Darryl is somehow suddenly incapable of talking to the new girl in the Warehouse. Seriously, I want to cry every Thursday night because when I watch The Office, it’s like looking in the mirror and finding a new wrinkle. However, The Office did have one genuinely great episode this year and that was, fittingly enough, Steve Carell’s final episode. “Goodbye, Michael” was a reminder of what made people like me fall in love with The Office in the first place and, as much as I hate to say it, it would have made a perfect finale for the entire series. 2) Sophia Shows Up On The Walking Dead..
…and Rick does what he has to do. 3) Nedd Stark loses his head in Game of Thrones. Much as Sophia had to ultimately be in that barn, Nedd had to lose his head. All together now: “Awwwwwwwww!” Actually, that would have been me if I was a member of the Royal Family. 5) Joel McHale as host of The Soup. Seriously, Chris Hardwicke is cute in a funny, nerdy sorta way and Daniel Tosh is like the frat boy that you turn to when you’re drunk and depressed but Joel McHale is still the best. With Dexter giving us a truly awful season this time around, Homeland was the best modern-day drama on television. Claire Danes deserves every award there is for her performance. Hands down, the best reality show on television. Dear NBC, if you fail to bring back Community, we’re done. I will leave you, I will cut you out of my life, and I hope you’ll be very happy with Whitney Cummings. Give this man his own show! Coming tomorrow: Lisa Marie’s top ten books of 2011.